Mathematics Day(Ganitotsavam) Celebrations on December 22, Sri Ramanujan Birthday Celebrations on 22nd December, School Level Activities, Mandal Level Activities, Maths Day Celebrations Action Plan Download, Action plan for celebrating Sri. Ramanujan Birthday on 22nd December, 2017;DSE & Ex-Officio SPD, SSA Telangana, Proc.Rc.No.4565, Sub : SSA, Telangana State, Hyderabad - Communication of instructions to DEOs of all districts to celebrate National Mathematics day on the eve of Ramanujan's birthday on 22nd December, 2017 in all Government schools -Reg. The District Educational Officers and ex-officio P.Os of SSA of all districts are informed that the birthday of the Greatest Mathematician of India Sri. Srinivasa Ramanujan is being celebrated as National Mathematics day on 22nd December, as a mark of respect, to get inspiration from his works and contributions in the field of Mathematics. In this connection an action plan is prepared for celebration of National Mathematics day in all the Government schools in the state and also at Manda! Level. AND TRAINING, TELANGANA STATE, HYDERABAD. 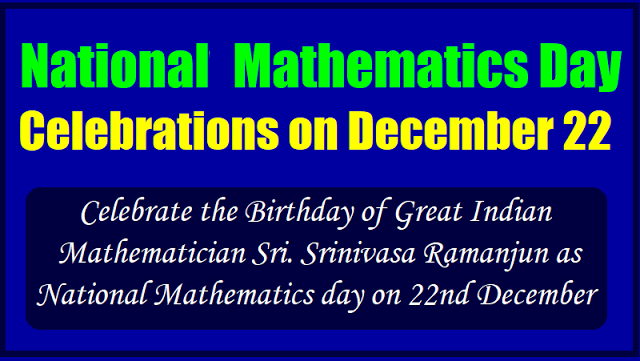 Sub: - SCERT, Telangana, Hyderabad - celebration of National Mathematics day on December 22nd- Orders - Issued. All the District Educational Officers and Principals of IASEs, CTEs and DIETS in the state are informed to celebrate the Birthday of Great Indian Mathematician Sri. Srinivasa Ramanjun as National Mathematics day on 22nd December in all the Schools and IASEs, DIETs, CTEs and Teacher Education Colleges in the State. Therefore all the DEOs and Principals of IASEs, CTEs, DIETs and Teacher Education Colleges are requested to celebrate National Mathematics day in their respective Districts/ Institutes with the following suggested activities. 3. Lecturers on Mathematics by Eminent Scientist/Mathematician of locality. 6. Origami & Poster Competitions & etc. The Activities mentioned above are only illustrative, the Schools, IASEs, CTEs DIETs and Teacher Education Colleges may opt for other creative activities also. In order to create interest in and attitude towards mathematics among the student community, prizes and certificates may be awarded to them for participations in the activities. Further they are requested to send the report on the said activities to the Department of Mathematics and Sciences, SCERT by 31St December, 2017 positively. The declaration to observe 22 December as National Mathematics Day was made by former Prime Minister Dr. Manmohan Singh on 26 February 2012 at Madras University on the occasion of 125th birth anniversary of Ramanujan. On this occasion, India and UNESCO agreed to work jointly in spreading the joy of mathematics and knowledge to students and learners across the world. An unparalleled genius and a self-taught mathematician, Ramanujan found his true calling in numbers and made extraordinary contributions to mathematical analysis, number theory, infinite series, and continued fractions. His love for maths was so much so that he failed most of the subjects in school. He didn't live long but in his short life he compiled more than 3900 mathematical results and equations, and his discoveries namely Ramanujam Prime and Ramanujam theta inspired further research on the subject. Proceedings Of The Project Officer :: SSA, Warangal, Proc. Rc. No. 201, Subject: SSA, Warangal - Pedagogy Wing - Conduct of Sri. Ramanujan Birthday on 22nd December, 2017 in the schools and mandal - Reg. The Mandal Educational Officers and Headmasters of all schools are informed that, the State Project Director, SSA, Telangana State, Hyderabad has directed to celebrate the birthday of one of the great mathematicians of India Sri. Srinivasa Ramanujan birthday on 22nd December, 2017. As a mark of respect and to get inspiration from his works and his contributions for the mathematics subject for the younger generation. In this regard, the Head Masters of all schools at school level and the MEOs of all mandals at mandal level should prepare an action plan and celebrate his birthday on 22nd December, 2017 in a festive manner. The MEOs should plan with the school complex Headmasters to conduct maths programmes as per the action plan (enclosed) at mandal level from the students who performed well at school/ complex levels. Accordingly, the Head Masters and also MEOs directed to meet the expenditure from the respective school grants and MRC grants for conduct of this event. Further, the MEOs are requested to send the detailed report of their respective mandal on the said event conducted to the DPO on or before 25th December, 2017.